This little fellow probably originated in south-east Asia from where it has spread to large areas of the world. 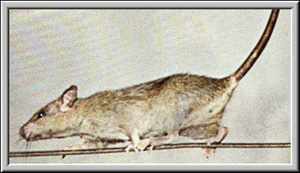 It arrived in Europe in the early Middle Ages and became very widespread until it was displaced by the brown rat. It can be identified by it's tail, which is always longer than the combined length of the head and body. It is also slimmer and more agile than the Norwegian or Brown rat. Its size varies according to it's environment and food supply, and comparison of the two pictures on this page show that colour is not a guide to species. 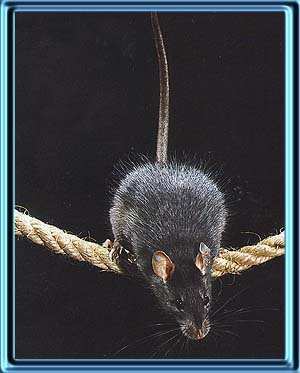 The Black rat is also known as the Ships rat and or Roof rat. In its natural habitat, the black rat is a tree-dweller. It is an excellent climber, and is particularly common among pines, palm trees and mixed scrub along the Mediterranean coast. It builds large, roughly spherical nests out of sticks and dry leaves up among the branches, but it will also nest in a burrow if there are no suitable trees. When living inside a building, it builds a nest in a hole in the wall, or in a cavity above the ceiling or beneath the floorboards. The black rat is nocturnal by nature, especially in the wild, but in well hidden, dark corners of barns and warehouses it may be active at all hours. Although basically a plant eater, it does in fact eat almost anything it can find, particularly when living in close proximity to man. Wild populations tend to eat fresh and dry fruit, seeds of all kinds, broad-leaved plants and tree bark, but they will also seize the opportunity to eat insects, slugs and snails, bird's eggs and nestlings. They also store excess food, often in places that are some way away from their nests. Although not a truly social animal, the black rat is not totally solitary. It normally lives within a small family group, organised on a hirearchical basis and dominated by one individual. Breeding is seasonal in wild populations, but rats that have all year round harbourage and food will breed all the time (see below). 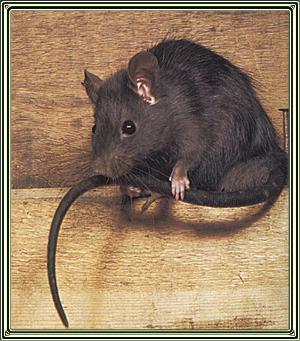 Although rats are considered to be dirty and unhygienic, frequenting sewers and other insanitary places, the black rat is cleaner in it's eating habits than the brown, and spends much time grooming it's fur, tail and paws (see below). This fellow likes moist fruits as well as cereals and will eat 15 grams per day. He still has to drink, but less than the brown rat, round about 15 ml per day. Again the lady rat is pregnant for about 3 weeks(Gestation Period). The litter size can be somewhat larger at between 5 to 10 per litter. Numbers of litters per year is between 3 to 6. The black rat takes longer to mature sexually, usually 12 to 16 weeks. The mortality rate is the same as the brown rat, i.e. 90%. The diseases are the same as for the brown rat, with the exception that the black rat carries the flea which carries the bubonic plague.